Introducing the GXP Platform™, a framework for the creation of custom enterprise solutions and the development of expanded capabilities. 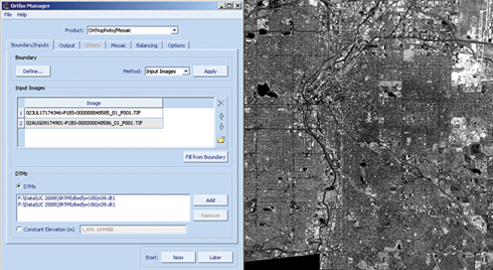 The Mosaic Manager provides increased performance for creating large area coverage orthomosaics, orthomosaic sheets or tiles, or individual orthophotos using input georeferenced imagery and terrain data. In addition, to create a nearly seamless output product, there are processing options for automatic seamline generation, seamline feathering, and image balancing to ensure uniform orthomosaic output. A new licensing system allows for the production of mosaics on multiple processors.